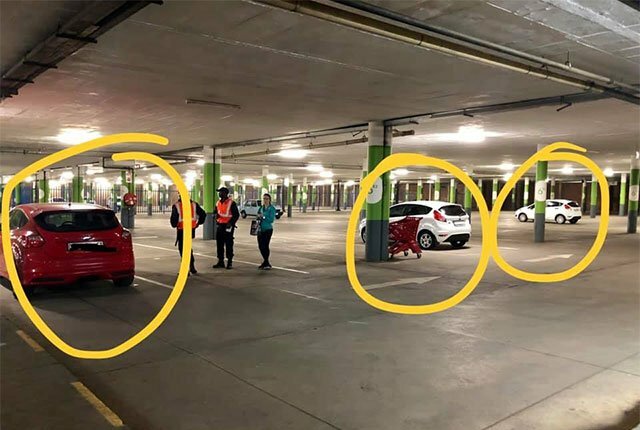 South Africa’s official 2018 matric pass rate of 78.2% does not tell the full story, as it ignores the large percentage of students who drop. Methods have therefore been proposed to measure a “true” matric pass rate for 2018. One way is to compare the matric pass rate to the number of children who entered grade 1 in 2007. This gives a pass rate of 40% when taking into account all the students who dropped out over time. Equal Education has said that it measures the pass rate by looking at how many grade 2 students from 2008 eventually passed matric in 2018. The number of children who repeat grade 1 tends to be higher than for grade 2, the organisation said. The DA prefers to compare the number of matrics who passed to students who enter the FET band in grade 10. You may elect to leave school after grade 9 in South Africa. All these calculations produce a pass mark well below the 78.2% mark. Another concerning measure is the number of students who pass matric compared to those who enrolled for grade 12. 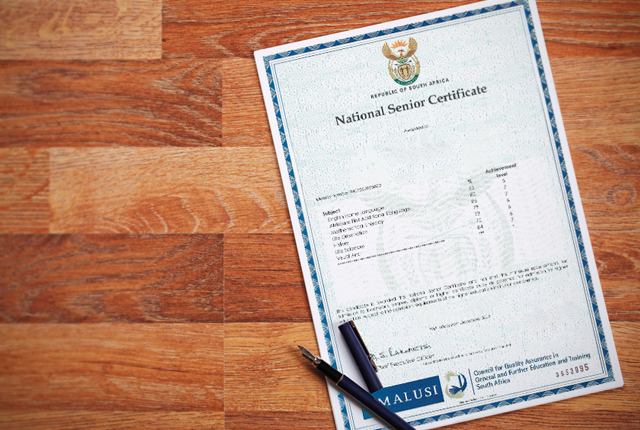 The official pass rate is calculated by dividing the number of passes by the number of matrics who wrote exams. However, a huge gap has started to develop in the number of students who enrol for matric compared to those who sit the exams. To see how the DA and Equal Education’s measures compare, we plotted them against one another, and the official pass rate. We also showed a recalculated pass rate for all students who enrolled for matric. The graphs below are drawn from data provided in the annual Education Statistics in South Africa reports prepared by the Department of Basic Education, along with its yearly NSC Examinations Technical reports. 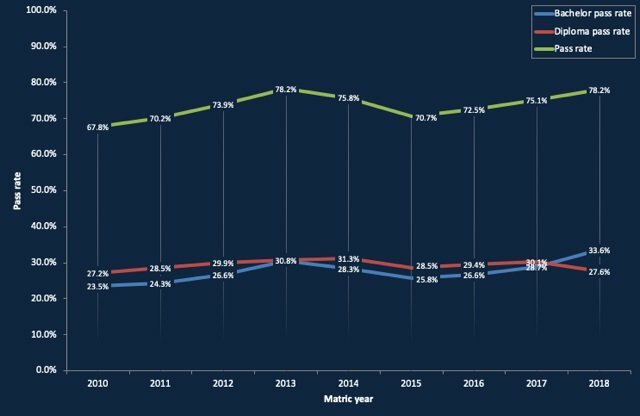 The graph below shows how the grade 2 and grade 10 cohort pass rates compare to the official pass rate from 2010 to 2018. It also shows the pass rate of all grade 12 learners who registered to take the matric finals, and not only those who wrote the exams. 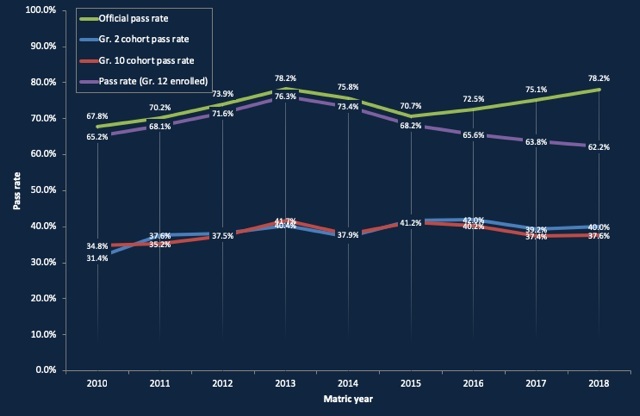 The graph below shows how the official pass rates, including degree and diploma passes, have changed since 2010.